Sticky Password is a complete password manager that can store all your passwords in a safe place, use when needed with a simple click and it will save you having to memorize them all separately. 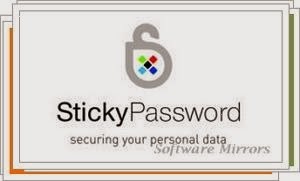 Sticky Password saves all passwords in a fully protected by powerful data encryption algorithms (AES / Rijndael, Blowfish, Gost, SCOP, Twofish and more, up to 8192 bits) and "master key", which will also be the only one you have to remember to access your passwords. Sticky Password has support for multiple user names and passwords within the same account, includes a random password generator and regularly backs up the database to not lose a key. But besides keeping the keys in a safe, Sticky Password allows you to insert it anywhere (web pages, FTP servers, instant messaging, etc.) Very comfortable, thanks to a button in the title bar of necessary window.